In this article, I'm going to explain how you can use the power of Visual Studio Code and Node.js to build a custom editing tool to overcome ornery blogging platforms and just write Markdown. The specifics of this article are tailored to the problem that we were having, but the strategy involved here can be applied to a great number of tasks where you'd like to use Markdown to create some content for a legacy system, or create other even more interesting custom editor workflows. For example, say you wanted to author some HTML for inclusion in an email, you are heavily constrained as to the markup that you can use. Working with a buggy web-based WYSIWYG editor which doesn't support entering code snippets very well, and incorrectly round trips existing content, causing the content to change in unpredictable ways if you edit it again. Using a button on said buggy web-based WYSIWYG editor to inject literal HTML code, which coerces the injected HTML into sometimes buggy forms, presumably to prevent unsafe patterns, but, generally, results in things not looking at all like the author intended. Working dark magics, and fighting murky single sign on systems, to hook Windows Live Writer (now Open Live Writer) up to the web service interface and injecting content from there, only to find the blog engine still mangling the submitted HTML in undesirable ways. Beyond the difficulty of actually getting the content into the system, there's the the fact that Infragistics blog content is heavy on the use of code snippets. These should, ideally, look nice, and have syntax highlighting. If you use a snippet storage service like Github Gist, you may think this part is easy, but our issue is that out Blog software specifically suppresses and removes iframe elements from the post content. I believe this is a security conceit due to the engine being inadequately prepared to delineate between post content and comment content as far as the editing is concerned, and you wouldn't want your comment writers injecting iframes! Finally, working in a WYSIWYG editor in a proprietary blogging portal doesn't afford you much in ways to review and iterate on content before it goes live. Ideally, someone should be able to ask for review of a blog post from peers or copy editors before publishing. The closest approximation we had to this was to post an unlisted draft post, and request feedback. However, there was no way to annotate and comment on the content inline, as you can in say, a markdown file stored in git with changes made using a pull request workflow. Now, thankfully, I'm assured we are updating our blogging software soon, to a much more recent engine, so this is a short-term problem I'm addressing (hopefully), but this short-term solution was not that difficult to create, may continue to be relevant after the update, and offers a great strategy for creating custom editing workflows to get around problems similar to ours. Many of our engineers would blog less or not at all due to the barriers to authoring and iterating on the content, lowering those barriers encourages more content. Doing anything but injecting literal HTML into the current system is pretty difficult, and even this needs to be done with care, as there are many HTML patterns that the system will ignore, destroy, or misrepresent. Working with the blogging engine's WYSIWYG editor or even Open Live Writer is a big pain, especially when working with code snippets, or iterating on the content. We need code snippets that look nice, and that don't explode when some external JavasScript goes missing. We need some way to have a review workflow for the content. VS Code is free, and has a great side by side Markdown preview when editing a markdown file. Node.js and gulp let us initiate a background task to continuously convert our Markdown files to HTML, whenever they are saved. If the editing experience is just to iterate on Markdown files in VS Code, we should be able to store those Markdown files in git, and use a standard pull-request review workflow to create a review process for out posts. OK, first we need to make sure that we have Visual Studio Code and Node.js installed as they'll be the main workhorses in this workflow. Once they are installed, we need to create a directory that will house the markdown files e.g. c:\Blogging and open VS Code pointing at that folder. This much should be sufficient to allow us to write a gulpfile.js that will continuously convert the Markdown files in our directory into HTML as they are saved, and to kick off the process with a Ctrl + Shift + B via some VS Code magic. This makes it so that when you press CTRL + SHIFT + B, it will start running the gulp command in the background. 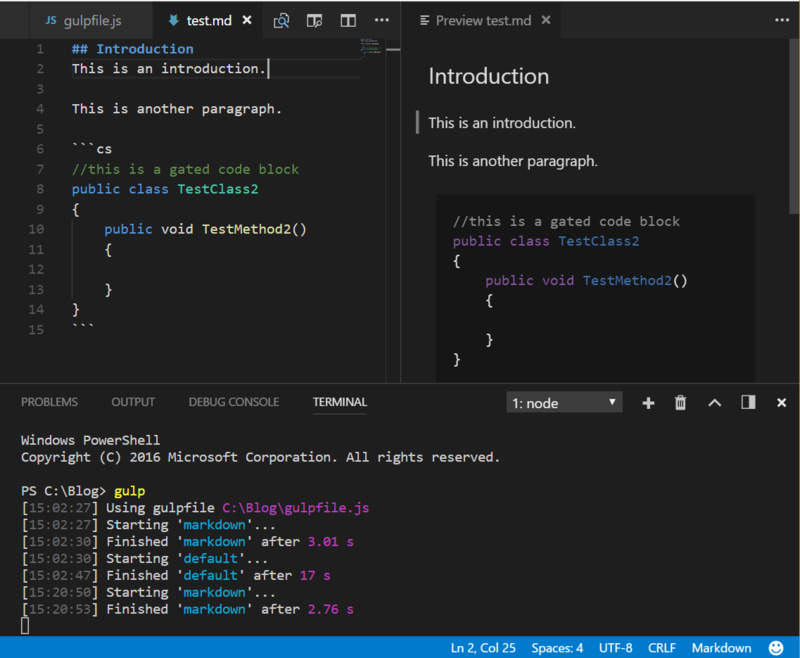 In this way, we are combining the markdown editor in VS Code, including its really spiffy preview pane, with Node.js, markdown-it, and gulp in order to create an awesome HTML editor. We'd prefer to render code snippets down to static styled html depending on no external JS or CSS style sheets. Our blogging engine messes with tabs embedded in pre tags (why, I have no idea). Our blogging engine fails to round trip line breaks within pre tags, often dropping them, so its safer to convert line breaks to explicit break tags or things will get messed up if we republish our HTML. Add a require statement so that we can use the highlightjs library. Configure the highlightjs library to use 4 non breaking spaces instead of the tab character. Use the highlight hook when running markdown-it to specify how the syntax highlighting should be performed for fenced code blocks. In this instance, we invoke highlightjs to do the highlighting. In addition to transforming the fenced code blocks, we perform a series of regular expression replaces on the output content to remove patterns of characters the prove problematic for the blogging engine, and replace them with equivalent safer sequences of characters. 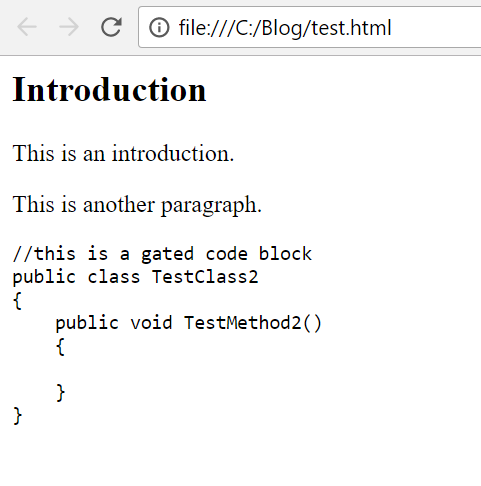 Its pretty ugly with all the line breaks removed from the pre tag, but now should play more nicely with the blogging engine. 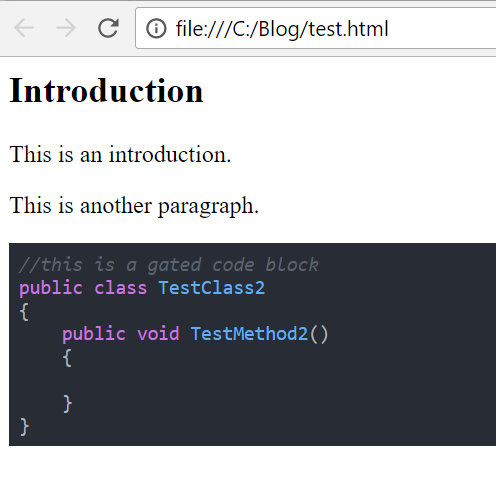 As I alluded to before, we can't inject any per post CSS into our blog articles, so we'd rather all the syntax coloring were baked directly into the HTML inline. loads one of the css files that ships with highlightjs and bakes it in with the HTML. Now, this can simply be pasted as raw HTML into pretty much anything that supports HTML, including ornery blogging engines! Hope you found this interesting and/or useful!